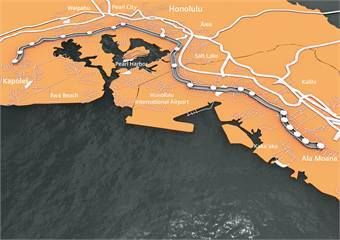 Siemens received a multi-million dollar order from Ansaldo Honolulu JV to electrify the track for the new Honolulu rail transit system. The rail system is the first for the state and is scheduled to be completed in 2019. The system will span 20 miles from East Kapolei to Ala Moana Center with 21 stations along the route, including Pearl Harbor and the Honolulu Airport. Siemens will supply 14 traction power DC rectifier substations at 750 volts and two tie breaker gap substations. The order also includes the emergency stop equipment at the metro depot and all stops on the line. Figures from the Honolulu Authority for Rapid Transportation (HART) reveal that by 2030, if rail is not put into operation, the number of car trips per day will increase by 40,000 on Honolulu's highways and streets. Rail will reduce daily traffic by approximately 30,000 vehicles and decrease delays due to congestion by an estimated 18%. It is also projected that approximately 10,000 jobs will be created as a result of the construction. "Cities everywhere are suffering from increasing traffic congestion. This has a negative impact on the environment and the economy," said Mirko Dusel, CEO of the rail electrification business unit. "Honolulu is a great example of how new rail transit systems can counter these effects and improve the quality of life for residents." The Honolulu rail transit system will be an elevated rail system, separated from ground transportation, allowing for faster, safer and more reliable performance than alternatives built at ground level, but less expensive than an underground system. According the U.S. Department of Energy, rail is more energy-efficient than single-occupant cars and trucks, consuming 37% less energy per passenger-mile.